03.28.08 Melanie Creamer, a news assistant for the Portland Press Herald and Maine Sunday Telegram, recently wrote an article highlighting the Cape Elizabeth chess program--this year's Elementary and Junior High School Scholastic State Champions. In case you missed it, here's the full text of the article that appeared in the Portland Press Herald on March 26th. Photo courtesy Ilene Schuchman The combined elementary and middle school teams include top row: Parent/coach Mark Parker, Ethan Di Ninno, Daniel Epstein, R. Antony Freccero, parent/coach Dan Fishbein. Row 2 from top: Brett Parker, Alex Silva, Shannon Daly, Will Kriger, Peter Campbell. Row 3 from top: Ethan Du Perre, Danny Brett, Colin Smith. Bottom Row: Jack Demeter, Leo Wing, Matthew Fishbein, Wesley Parker, John Xiang (Scarborough), Nicholas Shedd. Cape Elizabeth students end Deer Isle's reign as the state's top team. As chess matches go -- this was a nail-biter. During the final match of the Maine State Scholastic Chess Championships, Anthony Freccero, a 7th grader at Cape Elizabeth Middle School, out-maneuvered the dominant Janelle Ciomei, an 8th grader at Deer Isle-Stonington Elementary School to capture the junior high school title. Cape Elizabeth captured both the elementary and middle school state titles at the chess championships held on March 15 at the University of Maine at Orono. The event drew more than 250 players from across the state. 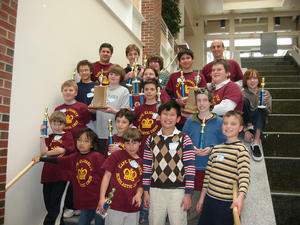 Nine students from Cape competed in the K through 6th grade tournament and seven in the K through 8th grade tournament. Mark Parker, parent-coach of the older players, said his team played well against Deer Isle, which has had an impressive number of wins in recent years. "They have a culture of scholastic chess at Deer Isle. They are a power house," Parker said. "This was an upset. The kids did really well. It's been an exciting experience." When the teams returned from Orono, they were greeted by the Cape Elizabeth fire and rescue squads who led them in a parade. "Some people donated their Saturday just to do that for us," said Matthew Fishbein, who won three of four matches in the competition. "I was really happy." Brett Parker, a 7th grader who scored perfectly in the tournament, said he likes playing in the competitions. He has been playing chess for about five years. "I think I did pretty good. It was kind of difficult, but it was a good reward -- winning," Brett said. His brother Wesley Parker, who won all of his games in the K through 6 tournament, said playing chess is a lot of fun. "I practiced a lot and I got really good. I have gotten better," Wesley said." The team practices for two hours every Saturday morning. Many on the team will compete in the individual championships held this Saturday. Dan Fishbein, parent coach of the elementary school team said their win stopped Deer Isle's eight-year run. "It's a friendly rivalry for sure. It has a bit of a Red Sox-Yankees flavor to it," Fishbein said. "The team was incredible. Everyone came through. Everyone contributed." Fishbein's son Matthew ranks in the top 100 10 year-olds in the country. Matthew learned how to play chess at a Mommy and Me class at Cape Elizabeth Community Services, Fishbein said, noting the benefits of playing the game. "There is a lot of research that shows that chess helps improve study habits and helps people think more clearly," Fishbein said. "There is no question that it increases their self-confidence."